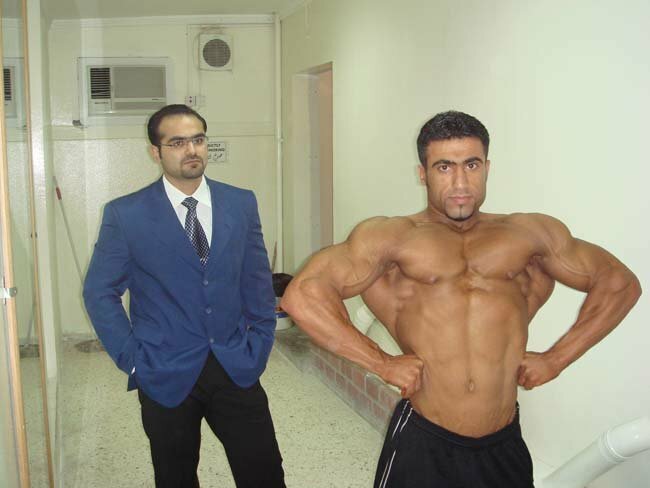 An Interview With Bodybuilding Training And Nutrition Guru, Ali Amini. 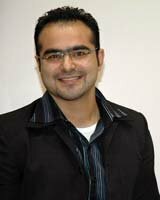 With an impressive resume and knowledge base, we are sure to hear more about Ali in the future. In the following interview Ali tells about his background in bodybuilding and what he has learned along he way. Competitive bodybuilding can be, at the best of times, one of the world&apos;s more demanding sports. Certainly for the beginner, bodybuilding and all of its interrelated pre-competition aspects, including nutrition, training, recovery, posing, supplementation, and tanning, can be viewed as a full time occupation. And this is part of its appeal. The sacrifices made and the effort required to develop a ripped, muscular physique are well worth the eventual result, and a lifestyle that involves bettering oneself mentally and physically is something most of us would want. At the professional level we might think that, after years of experience doing all of the above, the very best athletes in the world would have it all under control, they would know exactly what needs to be done to bring their physiques into line. Actually the reverse tends to be true. At the highest-level, bodybuilding becomes even more of a science, with many more potential problems to be overcome. The physiques we see on the pro stage are not merely the result of hour upon hour of torture under the iron and huge servings of protein-based meals. What we see are finely orchestrated composites resulting from precise approaches to all aspects of pre-competition preparation. A world-class physique is, more often than not, a result of the brain storming of one or several experts in the fields of exercise and nutritional science. These so called gurus are responsible for dialling a competitor in just perfectly; the athletes themselves simply do what is required of them. One man who has established himself on the bodybuilding scene in a big way is training and nutrition expert, Ali Amini. Originally from Bahrain, but currently working with many bodybuilding champions in the United Arab Emirates, Ali, 28, began advising and training bodybuilders in earnest, in 2005. As the number one pre-competition guru for the Gulf region, Ali has trained a sizable number of notables, including overall 2006 world champion, Ali Tabrizi, current Pro division Incorporated high flyer, Sami Al Haddad, and current IFBB professional, Wong Hong. An Interview With IFBB Pro Wong Hong. A man of many talents, Malaysian born Wong holds a B.S. and M.S in Human Nutrition and Food Science from Colorado State University, and plans to own a chain of gyms. As with all contest gurus, Ali has a specific, individual approach to achieving the best results for each of his athletes. With his impressive resume and vast knowledge base, we are sure to hear more about this expert in the future. In the following interview Ali tells about his background in bodybuilding and shares what he has learned along he way. [ Q ] What led to your current status as trainer and nutritional advisor to many top ranked bodybuilders of the Gulf region? When there is a will there is a way. I knew that nutrition was a major part of bodybuilding and I wanted to learn as much as I could. I guess I was blessed as well to have great bodybuilders around me like Ali Tabrizi (overall world Champion 2006) who helped me a great deal with the information I required in my early stages. Then I was fortunate enough to have friends who are ER doctors, ambulance nurses and pharmacologists and that again helped me a lot in knowing about how medications go in the sense of how and why they are manufactured. Should Personal Trainers Be Dispensing Nutrition Advice? Who is the most educated when it comes to providing nutritional advice? Personal Trainers, Sport Nutritionists? Get answers to that and more right here! [ Q ] What do you do to have achieved what you have with your athletes? What is your training and nutritional approach? I take very good care of my athletes. I get involved in all aspects of their lives so if athletes need to do shows, I arrange it for them. Plus I take care of their issues with the federation and promoter - that is as far as administration goes. Then for training I give them their training programs and supplementation cycles (drugs) and some posing advice if required or asked for. I tried out a lot of training methods in the past and the best cycle that worked for me was the Dorian Yates training cycle. I do not use all of his training principles or exercises, but dividing the body into four groups is what I emphasise. Then as for exercises, each bodybuilder has different weak points and based on that I design a training program specifically for them. Some people have super fast metabolism and with them I keep to three to four days of training per week and each body part is trained once a week only. [ Q ] You are known as the training and diet guru for the Gulf region. What does it take to be an expert in the field of training and nutrition? As I said in the beginning, I initially was blessed to have great guys in different fields, which are related to bodybuilding, to give me advice. The thing is there is no course or certification that will give this kind of information, so you must pick it up from all around. And I think I made very good use of the resources that I had and it paid off. At the moment I think the best way to be a leader in the "Guru" field is to have one of the top gurus teach you whatever he know and above all of that you have to have passion and an eye for bodybuilding. As I said, there is no book or learning material for this field. Everything in this field is tailor made, so you can&apos;t copy programs - having the top 10 Mr. Olympia programs will do you no good because each of them was designed for a different individual, body, metabolism, reaction to certain substances. [ Q ] You have a pretty impressive resume, having trained many winners, most notably highly placed PDI (Pro division Incorporated) athlete, Sami Al Haddad. What are some of the main principals you use when preparing your champions for competition? I prepared Sami first for the Musclemania after he was disqualified from the IFBB. He approached me and asked me to help him in his preparation. We did a 14-week program and he was stunned by the first three weeks. Then he experienced some personal problems and could not train or diet for two weeks. Then we started from scratch eight weeks out and I guess everyone saw the outcome. I contacted the PDI to have him do the NOC (Night of Champions) and NABBA for the Mr. Universe. All was set but fives weeks out and after giving him the complete program until one week out he decided to do everything on his own. At that stage we were on cruising phase and only some fat was to be burnt. On that day he was the best Sami ever to be seen to date. He was even ready to get on stage in couple of weeks. And he took some pictures wearing a white cap. So whoever views those photos I am sure they will agree. But for some reason he couldn&apos;t show up as planned. He contacted me later on for some ideas on carbohydrate depletion and loading, but that was all I gave him, ideas, no complete programs. And he skipped the Mr. Universe, which he could easily have won. The training principle I used with him was basically my training principle, which is a little of everything. One unorthodox thing I gave him was eight to nine exercises for shoulders. And he was shocked in the beginning and said, "Isn&apos;t that a lot?" I told him no and explained each exercise and why it is done. And believe me, once you know the anatomy of the shoulder complex muscles you will know why. And he improved his shoulders, which were his weakest part back then. When you compare his 04-05 pics you will see what I am talking about. His diet was basic, but the trick was that it was in the Holy month of Ramadhan and he was fasting from sunrise to sunset, which by that time was nearly 12-13 hours straight. But his nutrition program was fortified so he wouldn&apos;t loose any muscle and he kept all his gains. Ramadan is the ninth month of the Islamic (Hijri) calendar, established in the year 638. It is considered the most venerated, blessed and spiritually-beneficial month of the Islamic year. [ Q ] I understand you are currently working with IFBB professional, Wong Hong. What special training and nutritional requirements does he have as a professional? Well I started working with Wong 12 weeks out from the Australian Grand Prix 2007. And because this is the first time I am working with him I am doing everything with a safety margin because I don&apos;t know his body very well yet. We stay in touch on a daily basis through text messages, email and phone calls. And the feedback I get from him helps me evaluate his status. Preparation for Wong as a professional is not all that different compared to any other bodybuilder - the secret is in the amount and timing of training. As far as food and drugs go there is nothing gurus know and others do not. It is basic food and whatever is available in the market, but the trick is in how and when to use what and how much. It has been great working with Wong and he is a true sportsman and a real gentleman. We try to do everything professionally and so far he is doing a great job. He Is A True Sportsman & A Real Gentleman. [ Q ] Do you take an individual approach or are there certain aspects of training and nutrition that you have all your athletes follow? No. As I said each program is different according to a number of factors including the athlete&apos;s metabolism and reaction to substances. But I guess I always have oatmeal in meal number one. Abbas Khadeir, 29 Years Old. 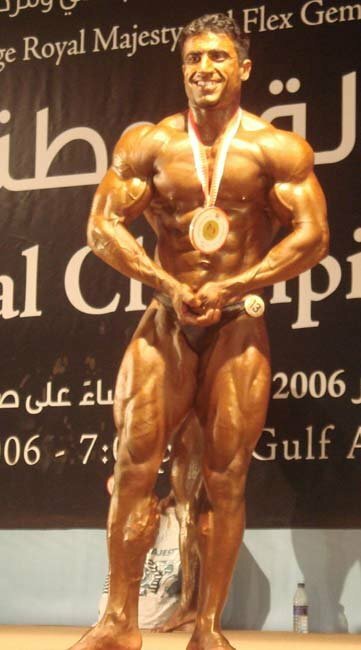 Winner Of The 2006 Bahrain Championships. [ Q ] What is most important in your opinion, training or diet? Why is this the case? We are talking about a chain reaction here, so there is nothing that is more important than anything else. 1/3 is the diet, 1/3 is the training and 1/3 is the supplementation (drugs). And the key to all of that is rest. If you don&apos;t get enough rest - and by that I mean sleep and enough time for the muscle to recover before hitting it again - you will not grow. 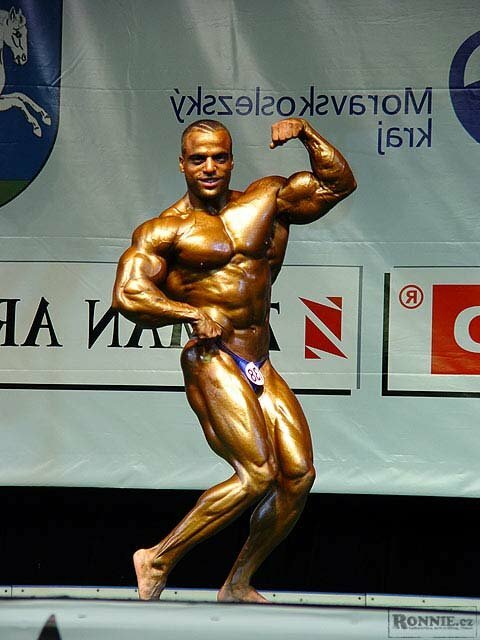 Ahmed Esmat, 2nd At The 2006 World Championships. [ Q ] You are refreshingly open about the realities of drug use for bodybuilding purposes. What are your personal views on drug use in bodybuilding? In your experience, how much of an impact do they have on bodybuilding success? They have a very big role in bodybuilding. And just to clear some issues. Every sport is drug enhanced these days. But with bodybuilding it is obvious because you have to show the improvement to your body. If bodybuilding were not drug enhanced there would be very few bodybuilders, and symmetry would rule judgment. But these days we see that condition can beat good symmetry and genetics. A lot of bodybuilders these days do not have good genetics or classic symmetry, but yet they do well in bodybuilding shows. So that is how much the drugs have influenced the sport. [ Q ] What is mostly responsible for the distended stomachs we see on some of the sports best? It is genetics and then it is growth hormone. I have guys on 8 i.u. of GH a day and they just get ripped in the midsection as time goes by and there are guys on the same amount who get a gut. So you either get a gut or you don&apos;t. All the guys with small waists do not make any extra effort to stay that way. Also, once a bodybuilder goes overboard with all the extra food and excessive amounts of insulin he will ruin his small tight waist. [ Q ] What are some mistakes bodybuilders make when preparing for competition, and during the off-season? What I am going to state now is strictly my opinion and I hope no one will be offended. Having a cheat day every so often is a problem in my view. When you diet you should be a man on a mission, but some think that a cheat meal will help them get fuller. That happens only if your diet is lacking calories. Cheat Meals Are Not Necessary! Cheat meals have some nutritive value, and while such food can serve a physiological need, refeed meals will provide all the physiological benefits of cheat meals. Some just start at a severely low amount of carbohydrates, get depleted in two days and then use a cheat meal to get full and go back again to what they were doing. Carbohydrates should be lowered gradually so your body can acclimate to the changes. You can alter carbohydrates from time to time and that is a very good idea, but your diet has to stay clean. With carbohydrate loading I have seen bodybuilders eat like crazy back stage only minutes before they go on. And they say it is to load. Well that will only bother you onstage and make your stomach swell up - and maybe you will feel dizzy also. Loading should be done anywhere between 1.5-3 days before the show and you should get all the "required" carbohydrates into your muscles - digested and stored. And I never could get the idea of using diet cola and ice cream for carbohydrate loading. Cardio in off-season is something some bodybuilders avoid. I always emphasise on doing cardio, even in the off-season. That will keep you in control of your body fat and promote good cardiovascular health with all of food you are in taking. Some people feel they can eat anything in the off-season. But even in the off-season you should stick to basic foods - just increase the amount of these. Of course you can have cheat meals and junk food from time to time, but only occasionally. You should get in the essential protein and carbohydrates that you need and then an extra meal or two per week will not kill you. There are also certain training mistakes bodybuilders tend to make. 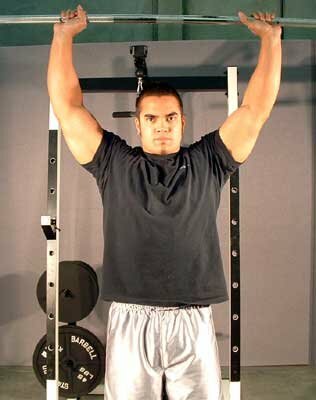 For example, the behind the neck shoulder press should not be looked at as a specific shoulder movement. Whenever the weights go behind you deltoid muscles that means a lot of other muscles are involved more than the shoulders. So you lift heavier but you are lifting with your lats and traps mainly. 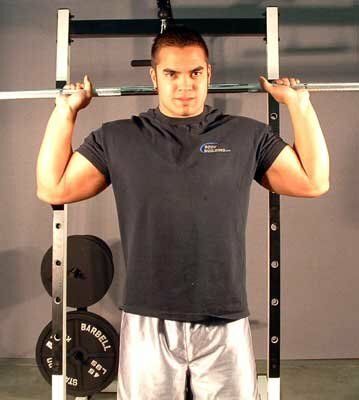 Behind The Neck Shoulder Press. Behind the neck pull down is another exercise I do not recommend. When the weight is pulled down, the abdominal muscles come into play and there is much bending of the back and neck. 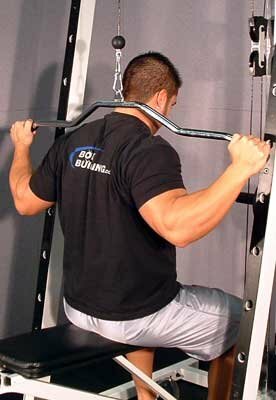 I prefer to do a modified version of it where you perform it as if you were doing a back double biceps pose, but without sitting on a seat. 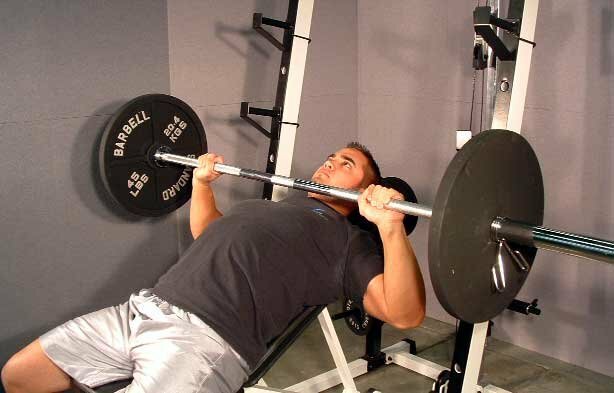 Starting with flat barbell bench press is another mistake. A lot of injuries occur because of that - Martinez, Federov, Freeman, just to name a few, have experienced problem with this. So I always start with inclines. [ Q ] How do you deal with problems of water retention? I mainly depend on carb and sodium manipulation, and then I look at cutting water. Other things I do are sauna and diuretics if it is an option or needed. (Anti-estrogens and anti cortisol med work as well). View Diuretic Products Sorted By Top Sellers Here. [ Q ] In your experience, what are the best ways to gain muscle? To pile on the muscle stick to a balanced diet, use heavy weights with proper form during training and get enough rest. [ Q ] How would you advise someone who wants to get ripped to the bone to achieve their best possible conditioning? A diet that matches his goal and body type is crucial. Then cardio is the key. Of course the amount, timing and type of cardio plays a big role as well. And final factor is consistency. You should stick to any plan long enough to know what is it doing or to see if it is working or not. That is as far as getting ripped is concerned. For putting on muscle you need to pump iron. Ali With Two Of His Champions. [ Q ] But some say that cardio will actually prevent bodybuilding progress. What are your thoughts? What specific advantages does aerobic training have? It again comes down to one&apos;s body type and how long they have been preparing for a show. Some people (mainly endomorphs) tend to get fat in the off-season and that puts a lot of stress on the heart. And that is when I mostly recommend cardio in the off-season - to control body fat and to promote a healthier cardiovascular system. For contest preparation some can get ripped without cardio and those are the genetically gifted. Some, however, have to cardio in an individualised fashion throughout the shredding phase. Of course if you start late for a contest-prep you will end up doing cardio even if you are genetically gifted. Type of cardio has a big role as well. I had some of my guys lose their quad size because of treadmill cardio so I used what Lee Labrada advocated and changed it to swimming. And with some, hardness in the glutes and hamstrings was an issue, so the step mill cardio was the best option here. The 10 Most Dangerous Pitfalls To Making Progress! There&apos;s a pitfall at every corner of the gym, waiting for both the complacent and the overzealous. In this piece, I have outlined what I believe are the ten most dangerous pitfalls to making progress on your physique. [ Q ] Where do you see bodybuilding heading? What are some of the latest trends and which of these will impact the sport most widely in the future? Bodybuilding will stay the same unless we have another Arnold in the sport. A person who can market and represent Bodybuilding same as Arnold in the current era is needed. I think the Bodybuilding community is still under the blessings of what Arnold did in the 70s through to the 90&apos;s through his competing and making movies. Now we need another person to do the same for the 21st century. And I guess the distended stomachs on bodybuilders really affect the image of bodybuilding in the future. 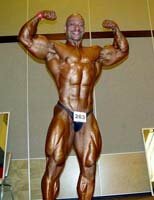 [ Q ] How might we expect bodybuilding competitors to look in ten years from now? I hope the way they are getting big doesn&apos;t keep on cruising because by then we will have dinosaurs onstage. Also, bodybuilders should realize that weight means nothing; it is the overall look and conditioning that counts. Abdel Wahid, 44 Years Old. I think it will go back to the classic physiques like Melvin, Dexter and Heath and Martinez. But we first we have to wait for Coleman and Cutler to step off the stage. [ Q ] Whom in bodybuilding are you most impressed with today and why? 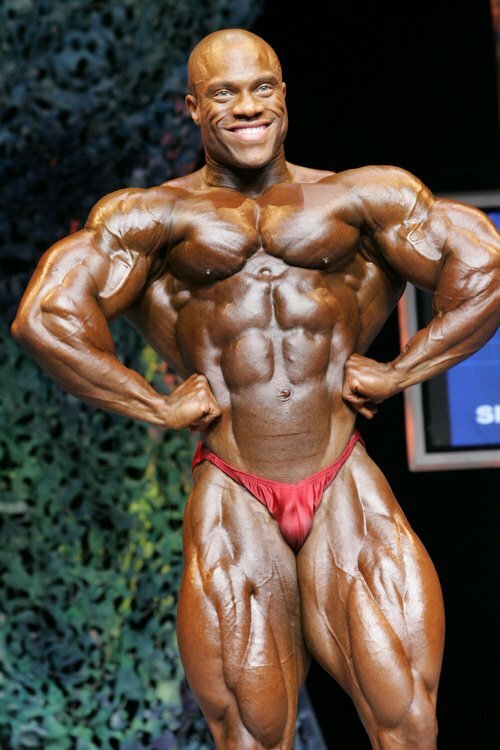 Phil Heath At The 2006 Colorado Pro. View More Pics From The 2006 Colorado Pro Here. [ Q ] Why are you impressed with Phil Heath? At the moment Phil is the guy who has doing things the right way and doesn&apos;t make a lot of mistakes in bodybuilding. What he achieved in four years, a lot of the other pros don&apos;t achieve throughout their careers. And the reason is good genetics, dedicated training, Hany Rambod, magazine hype, and other top guys saying he doesn&apos;t stand a chance next to the big guys. Gift Wrapped - Phil Heath&apos;s Auspicious Debut! 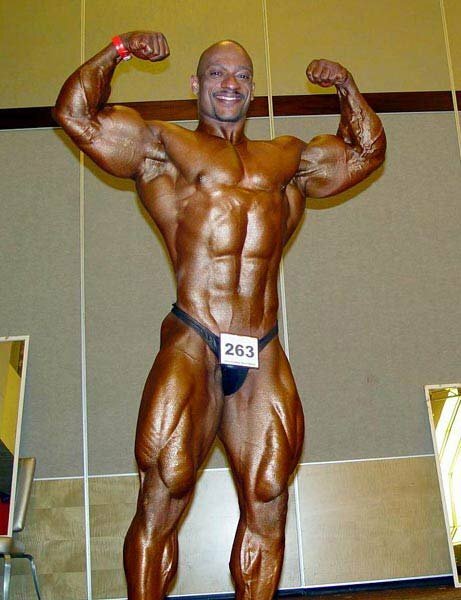 Phil Heath is seven for seven from the field on a bodybuilding stage. Here I&apos;ll discuss the controversy at the New York show and where he might place if he competes at the big dance. All of this has made a wining formula for Phil. Plus he showed up exceeding expectation in the last couple of shows he did. So I don&apos;t think he is overrated. He just has the right physique at the right time. And his conditioning is razor sharp. So whatever he is doing is working and whatever trash talk he gets from other pros helps him place higher. In an era of monsters, it is a sight for sore eyes to have a Phil Heath physique onstage that resembles those shown by Shawn Ray and Lee Labrada in their prime. 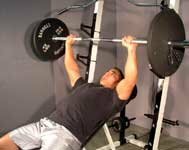 [ Q ] Speaking of top guys, what ingredients are needed for an average bodybuilder to become a top champion? One will need good genetics, mental focus, determination, honesty and integrity to make it to the top in this hard sport. Ali And One Of His Champions. [ Q ] Speaking of genetics, what physical qualities does a top bodybuilder need to succeed? He has to have very good body parts and the ability to get ripped first and foremost.